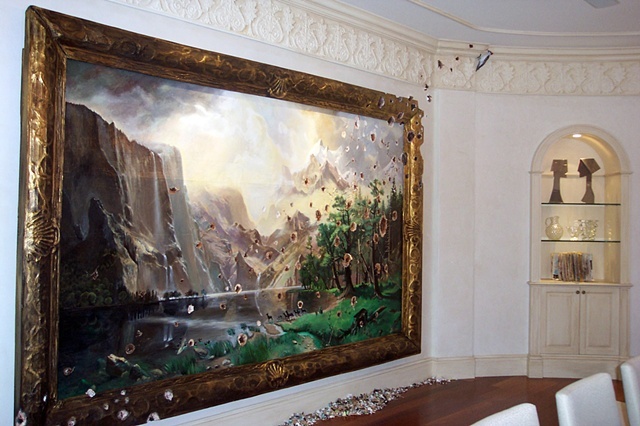 Conceived for the Nada Miami Art Fair, Among the Sierras with Woodpecker appears to be a master painting by Albrecht Bierstadt that has been riddled with machine gun fire. Only on closer inspection does the viewer discover the culprit is a woodpecker. Perhaps fooled by the realism of the the artist's hand, the woodpecker appears to have pecked holes throughout the painting looking for infestation. Almost as if it had emerged from the woodlands scene itself, the woodpecker has turned on the quintessential American landscape inserting an undertone of self-destruction into the narrative.